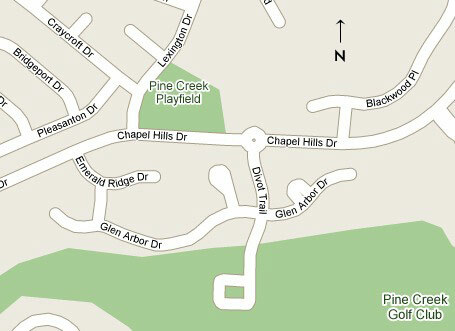 The Pine Creek Playfield located adjacent to Mountain View Elementary School at the intersection of Lexington and Chapel Hills Drive is a large sports field available to residents for general recreation. The playfield is perfect for most field type sports and is bounded by paths with picnic tables and trash cans. Pine Creek shares the field with District 20 schools who schedules it for La Crosse and soccer leagues.